Transcript of a reply letter to Capt. Thomas B. Kennedy from the regimental surgeon while Kennedy was recuperating at home from a leg wound incurred at the Battle of Cedar Creek on Oct. 19, 1864, with the bullet remaining in his thigh. The regiment was encamped in winter quarters near Petersburg Virginia in preparation for spring assaults on Petersburg and Richmond which ultimately resulted in Lee's surrender at Appomattox. Your very welcome letter of the 4th mail was received in due season after date and perused with much interest. Capt. Kinney who was wounded at the same time has returned to the Regt and reported for duty. The Major called the line officers together a few nights since for the purpose of voting for someone for Major. A paper was circulated the next day for Capt. Sperry who received eight out of twelve; this gave him the majority. But yesterday some clamored that the case was not properly represented and withdrew their names, but I understand that the major is going to give them another trial, candidates Sperry and Bushnal (sic). Sperry will doubtless get it whether he receives the majority or not at the 2nd ballot. We regret very much that you are not here to take a part in electing a major for the gallant old 6th Vermont, or what would be quite as satisfactory kept still while others voted. Please excuse my brevity as I have not time to write any more at present. The officers all send their best regards. Your Company is tough and rugged except Corp. Gould who has been unwell for a few days. Hoping to hear from you when you get a little leisure and will bid you good night. Capt. 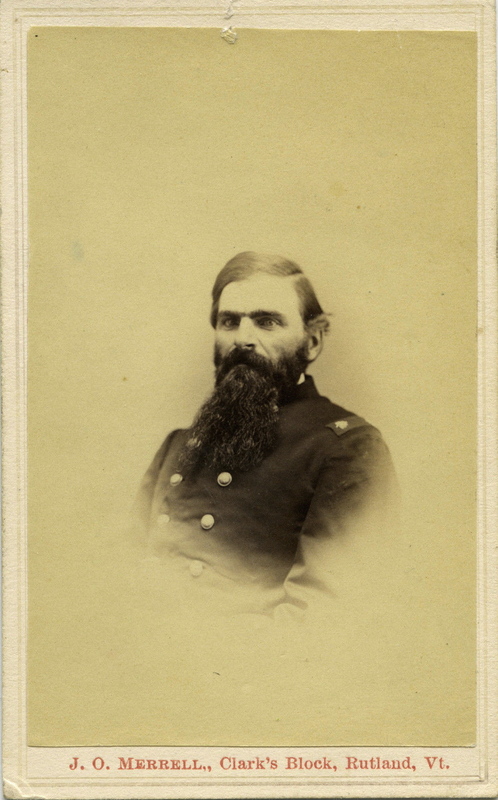 (later Major) Edwin R. Kinney (Burlington), Co. G. At the battle of Cedar Creek, the regiment was commanded by Capt. Kinney until he was wounded, at which time Capt. Sperry took command. Kinney had previously been wounded on 4/16/62 at Lee's Mill, the regiment's first engagement. "The Major" who called for election of his replacement was Sumner H. Lincoln (Hartford VT), who was being promoted to Lt. Colonel. Capt. William J. Sperry (Cavendish), Co. C. As predicted by the writer of the letter, Sperry was selected for promotion to Major. He was later awarded the Congressional Medal of Honor for his services in the assault on Petersburg. Capt. Henry N. Bushnell (Waitesfield), Co. H.
Edwin Phillips (Tinmouth VT) volunteered as a private, but became regimental surgeon in 1863. The "unwell" corporal was Enos M. Gould (Ludlow), Co. E, which had been combined into Co. K.
See also, Captain Kennedy's biography. RUTLAND, June 17 --- Dr Edwin Phillips, a native of Tinmouth, and for more than 40 years a practicing physician and surgeon in Minneapolis, Minn., who recently returned to Minneapolis from Rutland, after a short time in the hospital here, is dead in the city where he has made his home for so many years.Dr. Phillips died in St. Barnabas Hospital after four months of illness, which began before he left Minneapolis for his visit to Vermont. When Dr.Phillips Rutland for his home he was in very critical condition, being to ill to travel without a trained nurse, and Miss Edna Batchelder, of this city accompanied him, besides his friend, A.F. Kenyon of Minneapolis, who came to Vermont with him, intending to leave Dr.Phillips here, and go to New York, but on account of the sick mans failing so rapidly, remained with him here..